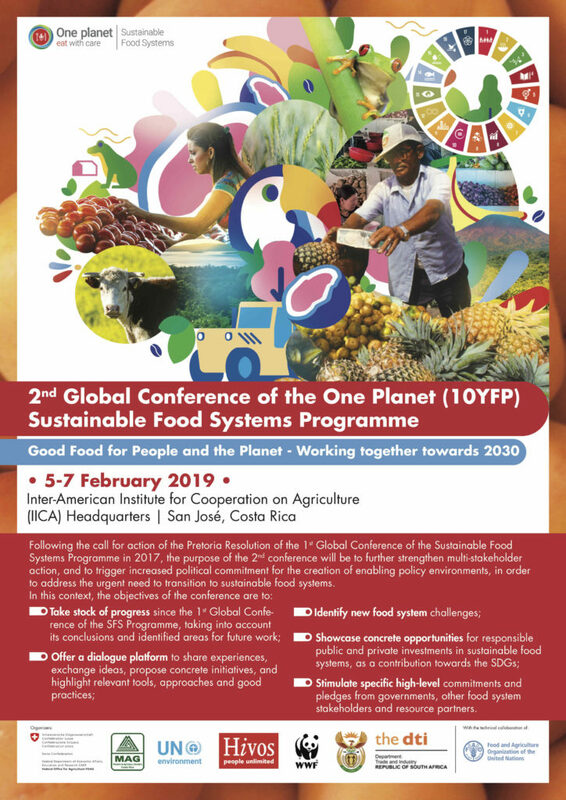 From February 5 to 7, the second Global Conference of the UN Sustainable Food Systems Programme (SFS) will be held in Costa Rica. The event is organized by the co-leads of the SFS program, of which Hivos is one. It brings together more than 150 participants to tackle the urgent challenge of transforming our unsustainable food system. In July 2018, the UN’s High Level Political Forum issued a Ministerial Declaration encouraging “all stakeholders to adopt a sustainable food systems approach.” Now, the 2nd global SFS conference ** aims to further simulate multi-stakeholder action and increase political commitment to change current food systems. The conference theme, “Good Food for People and the Planet – Working together towards 2030,” highlights synergies between natural resources, livelihoods, and nutrition. The conference will stress the need for a systemic approach that involves multiple stakeholders – including the most vulnerable or disadvantaged groups – to identify and implement solutions. It will also emphasize how taking action on food systems is a way to ensure we achieve the Sustainable Development Goals, given the cross-cutting nature of food. All people should have access to healthy and affordable food. Together, we can build a more sustainable future. Participants come from government bodies, the private sector, civil society organizations, research institutions and UN agencies. Various speakers are featured, including: the Minister of Agriculture and Livestock, Renato Alvarado Rivera; the United Nations Special Rapporteur on the Right to Food, Hilal Elver; Ambassador, Permanent Representative of the Dominican Republic to FAO, IFAD & WFP and Chair of the FAO Committee on World Food Security (CFS), H.E. Mario Arvelo; and the Director of Hivos Latin America and the Caribbean, Myrtille Danse. For all activities, visit the conference website. Just before the conference, Hivos will host two exciting activities: a gastronomy workshop and a photo exhibit. The workshop, titled “Sustainable, healthy and inclusive gastronomy as a key driver for sustainable food systems,” is organized together with Costa Rica’s Ministry of Agriculture and Livestock, Smaackmakers and IFOAM. It will explore best practices and lessons learned from diverse gastronomic experiences and make recommendations for a global proposal on healthy, inclusive and sustainable gastronomy. The photo exhibit shows people’s diets in and around La Paz (Bolivia) and how these are determined by the local food system. Ten women who feed their families, or who are closely involved in the food economy as farmers, vendors, cooks and consumers, describe what they eat every day. They discuss the emotional and physical importance of food and identify changes they would like to see in food production from farm to plate. Their stories show a food system capable of incorporating the country’s vast bio-diversity, but which is largely dominated by highly processed fast food instead. This exhibition is presented in the context of IIED and Hivos’ Sustainable Diets for All program. Let us take you to Indonesia, Bolivia, Zambia, Kenya and Uganda, where Hivos is getting street vendors, municipalities, cooks, farmers, activists and politicians to not only fight malnutrition in innovative ways, but also to slowly change the way the food system works. The event is hosted by the Government of Costa Rica, under the leadership of the Ministry of Agriculture and Livestock (MAG); the Government of Switzerland; UN Environment; Hivos Latin America; the World Wide Fund for Nature (WWF) and the Inter-American Institute for Cooperation on Agriculture (IICA), with the support of the Government of Germany (Federal Ministry for Environment, Nature Conservation and Nuclear Safety); and the technical support of the United Nations Food and Agriculture Organization (FAO). The conference will be held at IICA’s headquarters, in Coronado. The SFS Programme is a global multi-stakeholder partnership with over 150 global members that aims to accelerate the shift towards more sustainable food consumption and production across the entire food system. The SFS Programme promotes a holistic approach to successfully address the multiple challenges present today in our unsustainable food systems.